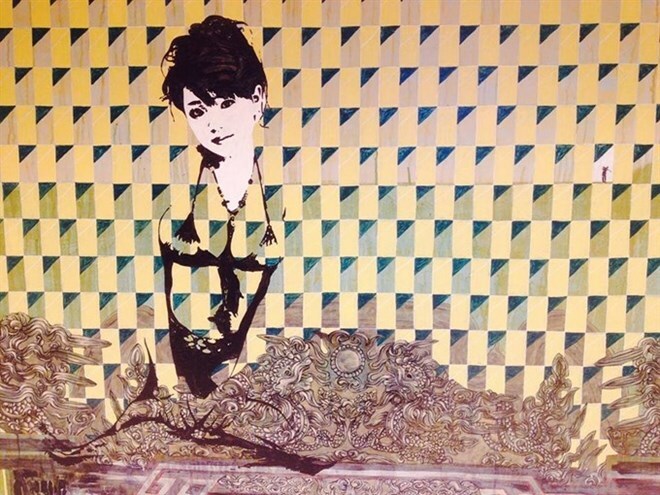 Hanoi (VNA) - Artworks inspired by the beauty of feminity are on display at an exhibition in Hanoi. The ‘Mascara’ exhibition showcases artworks by prominent contemporary painters such as Nguyen Nghia Cuong, Bui Thanh Tam, Vu Dinh Tuan, Nguyen The Hung, and sculptor Luong Duc Hung. The event is organised by Trang Tien Plaza and the independent art organisation – Real Art, aiming to bring art closer to the public. Explaining the name of the exhibition, Trinh Minh Tien, founder of Real Art, said mascara is a word that evocatives of music and vitality. Women’s portraits in Dong Ho folk paintings, statues in ancient temples and pagodas and artworks by Vietnamese artists in the early 19th century all show the soft beauty of tolerance, modesty and shyness. In the second half of the 19th century, portraits of women in the wars of resistance had a remarkable change: their beauty was depicted as strong, dynamic, assuring, attached to sacrifice and taking on the responsibility of their times. Portraits of contemporary women feature various beauties with more colours, various shapes and different concepts, reflecting the fact that women and artists have more opportunities to express themselves nowadays. “In this exhibition, visitors will see the contemporary artists have surpassed all boundaries to portray women’s soul and body,” said Tien. Nguyen The Hung is inspired by pin-up paintings. He often uses the image of models on posters or magazines combined with the patterns of historic Vietnamese architecture. “To me, this blend reflects the integration and ongoing conflict between traditional and modern elements and at the same time, its influence alters social values and core attitudes,” he said.